Having recently celebrated his 21st birthday, IM Robert Gwaze is seeking higher heights in the new year. What many did not realize, is that IM Gwaze had been there all along charting a course for his destined success. He has represented his country on board #1 in both the 2000 and 2002 Olympiad tournaments. In 2002, the former African Junior champion scored a perfect 9-0 in the Olympiad and as he won the gold medal for 1st board competitors. A very well-spoken individual, the young IM is seeking to enter invitational tournament to gain an honest shot at earning the GM title. He is yet another example of African talent produced with a minimum of resources. Zimbabwe has been one of the most active chess nations on the continent having participated in several Olympiad tournaments and southern regional competitions. Gwaze picked up the game at age nine from a close friend and began to make his mark in scholastic tournaments. The young lad from Harare took the chess establishment by storm winning the under-12 championship in 1993! This would be the beginning of his longest streak of success in the shadows of players such as Arnold Kanengoni and Kudzani Mamombe. He continued his march to the top by winning the Zimbabwe Junior Championship which qualified him for the prestigious National Championship. Then at age 15, Gwaze became the youngest player to win the National Championship and has held the title since then. To add to his impressive feats, he won the African Junior Championship and won the IM title as a result. He has represented the Zimbabwean National Team in three consecutive Olympiad tournaments earning a 2205 FIDE rating in the 1998 Elista tournament. There was more to come. "I spend 6 hours on chess everyday doing as many tactical problems as I can handle and analyse one game thoroughly." 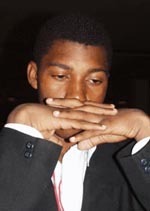 Gwaze led Zimbabwe in the 2000 Olympiad in Istanbul with 6½-2½ score, holding Romanian GM Mahail Marin to a draw and defeating IM Johny Ceuto of Bolivia. He also defeated Ethiopia's Mekitew Molla in a display of tactical brilliance. His performance was good enough for 7th place for board 1 players. The 2002 Olympiad would be held in the historic chess town of Bled, Slovenia. This city was known for its famous 1959 Candidate's tournament as well as the 1961 tournament featuring the likes of GMs Bobby Fischer, Mikhail Tal, Tigran Petrosian, Paul Keres and many other chess luminaries. It was at the scenic setting that Gwaze would make his mark by scoring an amazing 9-0 score for the gold medal. As the tournament wore on, the world's popular chess media paid little attention to what was brewing. One opponent after another the young Zimbabwe was able to continue his march toward Olympiad history. His games against FM Abdul Hassan (UAE), FM Wong Zi Jing (Malaysia), Dewperkash Gajadin (Suriname), Dafi Almannai (Brunei) made lasting impressions. After the final tally was made, IM Robert Gwaze would record a 2690 performance and overcome the brilliant performance of GM Alberto David who scored 11-2 but had to settle for the silver medal for board 1 players. When asked of his study regiment, Gwaze remarked, "I spend six hours everyday doing as many tactical problems as I can handle and analyze one game thoroughly." He also likes to get a healthy diet of lightening games with friends. En route to the 2002 Olympiad he even found himself in battle with members of the Jamaica national team in Gatwick airport. In terms of the materials, he finds inspiration in the games of Bobby Fischer. "My favourite books include My System by Aaron Nimzowitch, Think like a Grandmaster by Alexander Kotov and My 60 Memorable Games by Bobby Fischer." His rule for success is to go over one's games, especially the losses, and try to root out the inaccuracies. 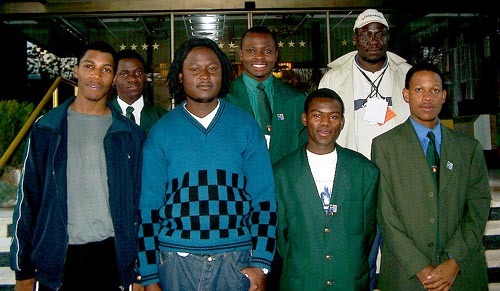 Zimbabwe Men's Olympiad Team: (front row, from left to right), IM Robert Gwaze (Bd. 1), Takaedza Chipanga (Bd. 2), Michael Luberto (Bd. 3) and Charles Chakanyuka (Bd. 4); (in the rear, from left to right), Wisdom Chikwanda (Bd. 5), Rangariral Karumazondo (Bd. 6) and Charles Kuwaza, (captain).